After the brainstorming (diversion) process, comes the filtering (conversion) process. This can take a few different forms, depending on whether you are doing it as an individual or in a team. The objective is to take your long list of ideas that you came up with and bring it down to 3-7 ideas that would be well suited to you or your team, which also has high market potential. 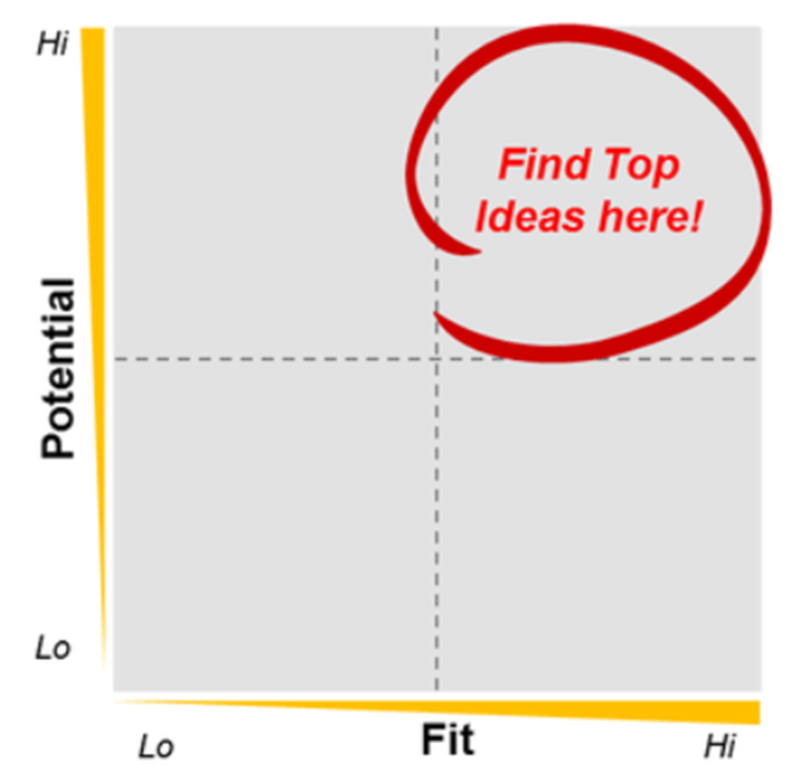 If you are assessing ideas on your own versus in a team, there are two basic filters to use – fit and potential. Roughly assess each idea based on these two dimensions on a scale of 1-10 using the questions below, then assess which ideas fall in the top right of the plot. How passionate are you about this idea? How enthusiastic are you to solve this problem? Does this idea play to your strengths? Would you be solving a real need? Are there enough people with this need who face it frequently enough to make it worth solving? Would customers be willing to pay for a solution? Can you differentiate yourself against competitors? If assessing ideas in a team, the above filter questions are valuable to read through as individuals to perform a multi-voting activity. Multi-voting is a means to narrow ideas quickly to the ones the team is most excited about and avoid wasting time on ideas people aren’t as interested to work. Next steps: The team removes all but the top ideas. Ultimately, being excited about the idea is more important than trying to find the perfect idea or market trend. Keep in mind that good ideas have almost always been tried before, and that entrepreneurial success comes down to focusing on the right initial customers and how you commercialize and execute on the idea. Best of luck!